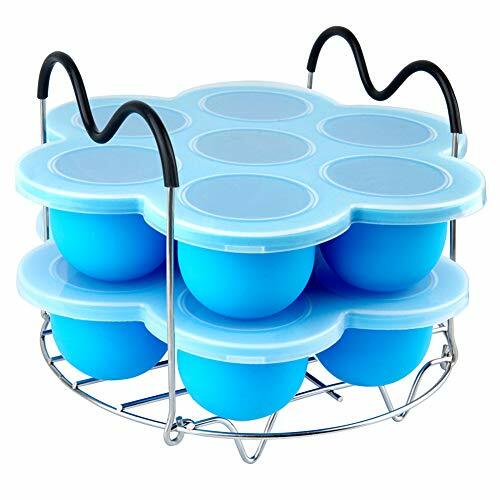 Egg Bites Molds × 2, Silicone Lid × 2, Steamer Rack with Silicone Handles × 1, Paper Recipe × 1. - 100% food-grade silicone, BPA free. - Size: 8¼* 8¼*2 inch, Weight: 250 g. Fits perfectly in 5/6 qt or 8 qt instant pot. ➤ Easy to Use - As its Non-Stick and Flexible Material, the cubes enable you to release the egg bites easily one by one. Just squeeze the bottom of the cube and the portion pops right out! ➤ Versatile - Tray and lid may be used in the freezer, tray may also be used in the microwave and the oven (up to 425 F) used for baking, for food storage or serving, or as a mold. ➤ Not just an egg bites mold, but also can be used for ice-cubes, and baby food freezer tray. And it is also a good storage container with lid for storing baby food, desserts, snacks and leftovers. ➤ 5.2 inch handles with heat resistant silicone to prevent burns while picking it up after a cook. ➤ Convenient to cook hard boiled eggs, steam the food with a plate, such as fish, crab, veggies and more. Or as cooling rack, pot stand rack, food holder etc. Dishwasher Safe: Each pressure cooker accessory is dishwasher-safe for a quick, easy and hassle-free clean up. With this super utensil, cooking time is much shorter and less messy. One Year Guarantee - If you're not completely satisfied with your instant pot accessories, please contact us and we will offer a prompt refund or replacement. If you have any questions about this product by PRAMOO, contact us by completing and submitting the form below. If you are looking for a specif part number, please include it with your message.